My name is Jason Zapata. I’m a thirty-year-old writer living in Northeastern, Pennsylvania. I graduated from the University of Scranton with a Bachelor of The Arts degree. My major was history along with minors in writing and communication. History is a rich resource for writers. The past offers so many interesting places, figures, and moments. I am a proud fiction fanatic. My favorite authors include Anne Rice, Edgar Allan Poe, Terry Brooks, and Neil Gaiman. I love epics. I’ve read “The Legend of Drizzt” series by R.A. Salvatore. I’m currently enjoying “The Dresden Files” series by Jim Butcher. I also blog about other media that matches my literary interests. Contemporary art is very inspiring to me. I enjoy and often blog about the artists I discover on deviantArt. There is an abundance of talent showcased there. Current artists I follow include: Abigail Larson, Alex Ruiz, and Dan Dos Santos. I enjoy fantasy and science fiction films as well. The 80’s were a golden age in fantasy movies. Labyrinth, Willow, Legend, Lady Hawke, and Conan influence my writing. I’m proud of my work. I, Dracula is an epic poem I wrote in 2012. Over 200 lines in length, it took the better part of a year to finish. 14 Years: The Chronicles of Sir Reginald the Damned is an ongoing short story series that will be compiled into a novel upon completion. 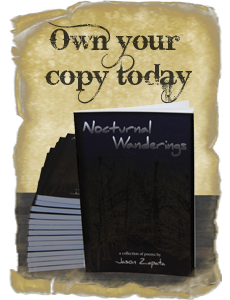 And I have recently published my first collection of poetry, Nocturnal Wanderings. My goals are to continue creating content for this site. I see myself publishing another book of poetry sometime in the next three years. Currently, I’m striving to complete my first novel – “The Jester’s Mask”. It’s currently in revision hell, but I hope to have it completed sometime in the next two years.